In 2015 the Main Street, Trumansburg, NY building owned by Ben Guthrie and Hilary Gifford needed structural repair to the foundation. That created a nice creek-side patio area but no way to get to it. They made plans to add stairs and have artistic railings created by metal artist, Durand Van Doren. A window at the Gimme Coffee shop was replaced with a beautiful salvaged door to get to the stairs. But across from the patio the view was a glaring empty cement block wall and they soon decided it needed something. That's where I come in. Hilary got a group together for ideas and input on a mural. The general consensus was that the design should be natural. I put together a design that they liked and Hilary submitted it to the Community Arts Partnership which gave us a grant to cover part of the expense and we were off and running. There was a lot of planning and fundraising to be done and Hilary took care of that brilliantly. 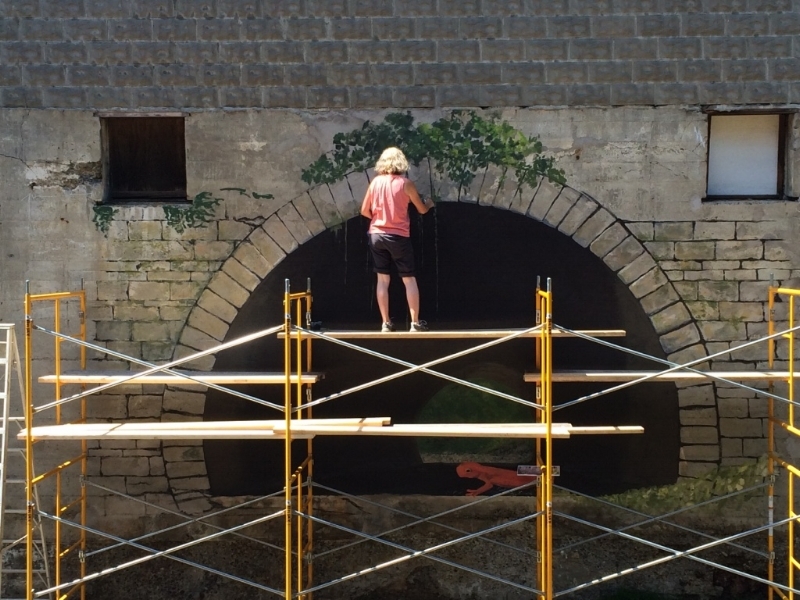 Ben Guthrie, Hilary Gifford and I beginning the mural, summer 2016. There was much preparation before starting to paint—cement work, power washing, sealing the wall, setting up scaffolding, etc. Ben was a master of all of that. And he helped get the arc correct for the tunnel which was crucial. Hilary and I began the painting on July 24, 2016 in the heat of the summer. (We quickly discovered that it was worth waiting for the shade of the afternoon.) The summer was one of drought, which actually allowed us more access to the creek bed. The tunnel is roughed in and I have started the 'stones' and a bit of vegetation. Hilary has roughed in the other end of the tunnel as well. We purposely left the rough and broken-looking areas in order to make it feel like a place that had been abandoned for a long time. Of course it has still been prepped. Here is a better view of the tunnel area once the scaffolding was moved. Here I am adding one of the vines and a shadow beside it that will make it look like it is away from the wall. I'm getting used to working on the top of the scaffold and have put in more of the greenery and the first amphibian has been roughed in at the edge of the tunnel. This view from the bridge shows more of the expanse of the wall we are working on. I designed it so that we incorporated the crumbling look and rough stone of the creek area. Adding the foliage was the slowest work. Slow going but here I have added another amphibian and am working on the highlights of one of the ferns. Here, the first phase is done. We hope to add to the left side of the wall near the bridge in the future.